Modules can implement a health check method which returns an integer value, representing the health state. By definition, -1 means no health check is implemented and 0 means "OK". All other values can be defined by the developer itself. The response will contain the status code in the response body. The request has to be executed at least with an app member having the READ_HEALTH role. On the left side of each module is a small vertical bar bar displayed. This bar could be green (code: 0) or red (specific error code). When there is no health check implemented, the bar isn't shown. 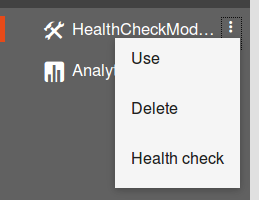 Furthermore, you could use the context menu of the module to check the health status again. 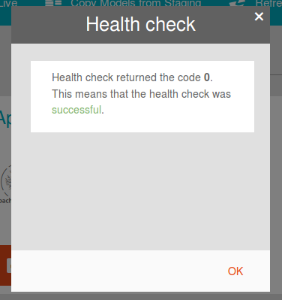 With clicking the "Health check" button open a dialog opens, that shows the result and explains it.